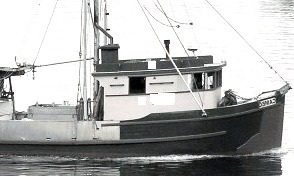 Again and again, ocean swells lifted the F/V Bluebird three stories skyward, then dropped the 26-foot troller into valleys between collapsing mountains of saltwater. Jim Blades reassured his 6-year-old son as he zipped him into a bright orange survival (immersion) suit. He wished they were home. He and his wife, Jill, lived with their children a few miles from Sitka, in a small log house perched on floating timbers in a protected cove. He pictured Jill and their other 4-year-old son — safe but wondering how Jim and little Clint fared in the sudden icy storm. In their two-room cabin a crackling VHF radio spat Jim’s pleading voice to the Coast Guard Air Station at Sitka. Jill listened as the Coast Guard dispatched a crew in an H-3 Pelican helicopter to locate and rescue her husband and child from the sinking Bluebird. It took about 18 minutes for my crew and me to travel 10 miles to their location and descend to the dot of light below. Snow and ice mottled my windshield, and my radar altimeter warned that I hovered 50 feet above the Bluebird’s jousting mast. Our spotlight captured the fishing boat as we spoke to the skipper inside their flickering lantern-lit cabin. Jill heard me giving her distraught husband instructions about our plan to hoist father and son into our helicopter, while I wrestled controls, trying to perforate each gust of wind, nose down, tail rotor up. I positioned the helicopter’s belly a safer distance above the tall rigging below me, moments before the F/V Bluebird slid beneath the waves. My father, and namesake, served aboard aircraft carriers in Great Britain’s Royal Navy, and I carry a faded portrait of his kind face in my heart. He died of polio in a foreign land when I was 2 years old, and my mother and I moved home to England, where my brother was born. In this depressed era in the early 1950s, Mum found work with the Cunard Line, a cruise ship company that employed nannies to care for children of upper-class passengers. Mum sailed between Southampton and New York aboard ships like the RMS Queen Mary and RMS Queen Elizabeth. Winston Churchill said that the “Queens” had shortened World War II by a full year, by efficiently transporting Allied troops, but I didn’t care a whit about Churchill’s musings. My war was with feeling abandoned. Mum had left my brother and me with my Uncle Reg and Aunt Maude while she sailed between two continents. In the aftermath of the blitzkriegs of World War II, relatives and friends often stepped in to help raise children of broken families. For a woman with no husband or support, times were especially hard, even decades later. I felt like a million miles separated Mum and me. In my 5-year-old mind, I prayed to my “Father in Heaven” who wore my Navy dad’s smile. Walking home after primary school, I begged Dad to bring my mum home to me, and I projected Mother’s lovely image at the door, with open arms. During the times that Mum did visit my brother and me, she lovingly but forcefully counseled that I should never expect life to be easy. The day she left again to care for other children on the ships, I clung to her neck weeping, and it must have broken her heart, too. I was 7 years old when my mother married Edward, a very proper Englishman, and for a short time we were a family together. We lived in a picturesque thatched-roof cottage called Holbury Mill — but our quiet English life didn’t last. Mother had tasted opportunities on the other side of the pond, a country where any enterprising individual might prosper, regardless of social status. My new dad complemented my mother’s vocation with his own skill set — Edward was a chauffeur and butler — and the restless pair hatched a grand scheme. They delivered my brother and me to Marchwood Park Boarding School and sailed off to the United States. My mother and dad landed employment with the family of Metropolitan Opera diva Patrice Munsel, caring for her children and traveling in her entourage across America. I never saw Mum for two years. I was forced to adapt to a brand-new regimented lifestyle — and it fit my personality, hand in glove! Mother’s mantle of drive and enterprise settled on my shoulders at Marchwood, and I discovered a wellspring of self-reliance. Marchwood instructors taught the Bible as historical literature, and I accepted religion as part of my English heritage. I attended mandatory Sunday Episcopal church services, and I yearned to live my life somehow connected to God. It was without a single cleric’s urging that I sensed an all-knowing Presence traveling my flight path. I can thank the Cuban Missile Crisis for awakening Mum to a need for her sons to be at her side. She feared that a nuclear war between the West and the USSR might separate us forever and asked my godparents in England to help us obtain travel visas. My brother and I arrived in the United States just after Christmas in 1962, and my world changed — again. I’ll never forget our drive from the airport in San Francisco to our home in Los Altos. My stepdad sat behind the steering wheel on the wrong side of the car and drove on the wrong side of the highway! Gaudy neon signs of every imaginable shape lit up the humid, warm California night, and automobiles and lorries roared past us at thrilling speeds. My new culture immediately rewired my staid British constitution. I had to learn new names for common terms (like “restroom” in lieu of “loo” and “soccer” instead of “football”). At our new grade school, my English “Beatles” accent set me apart, and for a time I enjoyed a bit of social celebrity. I immersed myself in everything American — from forelock to bellbottoms, adapting once again to my surroundings. For some years Mum and Dad worked on holidays serving as butler and server for wealthy clients in the San Francisco area. My brother and I often sat in the guestroom of some mansion, watching TV until my weary parents drove us home. In years to come, Dad opened his own business restoring antiques and repairing furniture, and my persevering mum became successful in real estate. I seemed destined for a quiet Northern California lifestyle like my folks, until the winds of adventure blew me off course. A U.S. Coast Guard recruiter visited Los Altos High School and ignited my interest in flying aircraft, so I put in an application for the U.S. Coast Guard Academy. I wasn’t a naturalized citizen at the time, and my dream nearly crashed at takeoff. After high school graduation I enrolled at San Diego State University — pursuing the game that embodied every ounce of my driven personality: soccer. After finishing four years of college (I became a naturalized citizen at 18), I interviewed in San Francisco and was accepted for training at the Coast Guard Officer Candidate School at Yorktown, Virginia. I was 22 when I joined a motley crew of college kids from various regions for 18 weeks of mind-bending indoctrination. When my folks saw me again, a striking metamorphosis had occurred. I was a spit-and-polish flight school candidate, and the USCG commissioned me as an ensign with a lofty objective: to fly helicopters. After just 10 months of flight school, I was designated a naval aviator and reported for flying duty at Coast Guard Air Station, New Orleans. Like an aircraft refitted with fresh engines, I felt equipped. I was proud that destiny rewarded my hard work and force of will. I held the controls to my future: in my Coast Guard career and in my personal life, too. I married my senior officer’s daughter — no doubt the most beautiful, kind, intelligent young woman I had ever met. My commander at USCG Station New Orleans had invited me and other ensigns to his home for dinner when I first saw her. And at the time, I never dared to consider dating my boss’ girl. In New Orleans we fell in love, and it was more than a romance — we each found a partner for life. A month before our wedding, tragedy tested our love when Lauri’s brother was killed in an accident. A tidal wave of grief threw our futures into doubt for a time, but we decided that a celebration of life might help heal our family. We continued with our wedding plans, sharing sweet memories of Lauri’s brother every day thereafter. From the beginning of our relationship and throughout our marriage, facing turbulent circumstances has only strengthened Lauri and me — though, in our bittersweet season we barely fathomed the power our commitments would have in years to come. About a year after our wedding, the Coast Guard stationed me at Kodiak, Alaska, where my first son, Ian, was born. My job description grew more and more intense as I juggled home life and Coast Guard responsibilities. I had advanced to piloting 10-ton helicopters, and I participated in rescuing passengers of the sinking cruise ship Prisendam, action date, October 4, 1980. A year after the Prisendam rescue, my second son, Colin David, was born while we lived at Kodiak. While serving at Coast Guard Air Station at Astoria, Oregon, my third son, Christopher John, was born, and in 1985, I boomeranged back to Alaska. During our first Kodiak sojourn, we had grown to love the Last Frontier and its people. Lauri and my three sons set down roots in Sitka where I served as lieutenant commander of the crew of an H-3 Pelican rescue helicopter. For two years we built our lives around my work at Air Station Sitka, as I flew closer to events that would change me, my crew and my future forever. In Alaska’s unpredictable weather and mountainous terrain, during practice runs and in rescue deployments, I noticed icy streams of angst slithering past my brash self-confidence. On night flights, when my Pelican convulsed in blinding storms, I prayed in my head: “God, if you just save me this time, I’ll stop …” whatever “sins” came to my mind. But after returning safely to the air station, I would shakily laugh off my pledge. But I knew that the Presence I felt as a boy had never abandoned me, and I recognized him whenever I flew in deep sh**. The U.S. Coast Guard motto is plastered on manuals and plaques at every air station across the country, but I never felt “ready” when people could die if I failed. In storms, while strapped inside a 10-ton eggbeater, darkness is a pilot’s worst nightmare. And to whom could I entrust the lives of my men and survivors when flying 50 feet above ocean chaos? As a hardened 32-year-old lieutenant commander, I believed the buck stopped with me. My pilot training dominated my emotions when flying a mission, and I depended upon my team to back me up — the four Coast Guardsmen jolting in seats beside and behind me: my copilot, Lieutenant Greg Breithaupt; my flight mechanic (AD1) Carl Saylor; Avionics Technician (AT3) Mark Milne; and Second Class Aviation Survivalman Jeff Tunks. Even before we left the helipad at Air Station Sitka, to locate the foundering Bluebird, alarms clanged inside my head — a wind gust slammed our fuselage, spinning us around 30 degrees. Snow blew past us horizontally as we lifted off. After several minutes flying the coastline, someone in our cabin identified a light a few miles out to sea, bobbing in the whitecaps. The Pelican swept into a long ungainly turn as steady air currents heaved us six miles off our intended course. As soon as we found the speck of light again, we radioed Jim Blades about our rendezvous moments away. Back home Jill Blades was praying. In fact, Jill had radioed dozens of friends who contacted their friends, forming a traditional log-cabin “prayer chain.” Each new “link” called upon God to save the lives of Jim and Clint Blades — and our rescue team. As for us seasoned Coast Guardsmen, only one of us aboard the H-3 had any clout with the Man Upstairs: our flight mechanic, Carl. He was a man who identified himself as a follower of Jesus. He was praying, too, unknowingly linked to the chain of petition reaching from the mainland, to the Gulf of Alaska and heavenward through God’s airspace. As we moved across the darkened seascape, my search beam flung light off the whitecaps like a disco ball. To say I was multitasking is a far cry from reality as I tried to position our bird above the swamped little troller. “Up! Up! Up!” Carl stared down at the lance dipping and rising within four feet of our aluminum gas tank. The Bluebird’s mast rose and fell on the swells — and sometimes the waves reached far above the rigging. My visual points of reference lurched in all directions through a windshield streaked and blotched by snow and ice. I wrestled two levers (controlling altitude) and two foot pedals (rudders for turning), trying to hold the Pelican level. My radar altimeter performed insecurely, often acting as disoriented as I was — the world below us was liquid, changeable, random. I had barely attained an erratic position above the Bluebird, when I lost all control. Greg was screaming, “Full power! Full power!” and I was yelling, too. I glanced down at my rate of speed and held my breath — we traveled at 57 miles per hour, in reverse — while I pushed the overheated twin engines forward to the point of rack and ruin. I looked at Greg, and our eyes exchanged wordless farewells. In a timeless moment of calm, I reasoned, This is it. We’re going in. But Carl wasn’t there. He was strapped in, along with Mark, at the back of the cabin. And Carl was praying. This Presence at my shoulder remained rooted to his position, and instantly I knew who was there. No commitment. No words. No spiritual understanding — but in those seconds of recognition, perhaps I, too, grabbed hold of Jill’s prayer chain. The Pelican stopped its angled descent dead, engines still screaming in protest, our tail rotor only an arm’s length away from boiling waves. We hovered for a few seconds, and my altimeter read 15 feet. Suddenly, my controls obeyed orders again, and like a rock from a slingshot, we popped up and forward above the Bluebird. No sooner had we repositioned our craft, hoping to let down the rescue basket, than a gust forced us back again like before, twin engines howling. Straight from the bowels of Mt. Edgecumbe, three hellish blasts thrust our helicopter backward. Each time, we lost reverse momentum just before crashing into waves, as if a giant hand gently scooped us up. I took the bird higher and contacted Jim Blades. It was impossible to set the rescue basket on the heaving deck of his 26-foot Bluebird or maintain a position above it safely. The boy and his father would have to abandon the sinking troller immediately. Entrusting their lives to us, Jim strapped his 6 year old to his suit and stepped off the Bluebird’s swamped stern. Sadly, the moment he submerged, Jim’s suit leaked frigid seawater, and hypothermia stole away his reason. He needed to swim clear of the boat so we could swing the basket to him, but all he could do was float like a water-logged life preserver, his child on his chest. He had minutes to live. Should we throw them a life raft? It wasn’t an option now. Only one feasible rescue alternative remained. Jim was too weak to even grasp the basket and roll in. I had no time to reconsider. As Carl lowered Jeff into the blackness below, I tried to hold the bird steady. I watched the wooden troller’s lantern-lit cabin slip into jagged ripples as it went black. Two forlorn figures bobbed where the boat had been. Greg and I trained our spotlight where Jeff was ready to detach from the line — but suddenly a gust swept the helo up and sideways, slinging Survivalman Tunks nearly a football field away from the Blades! Jeff detached from the sling, and our beam followed him as he tried to swim in a direction he guessed he should go. Once again I credit this merciful, logical Person on scene who helped us decide the next course of action. Instead of training our light upon disoriented Tunks, we lit up Jim and Clint, floating in their florescent-taped survival suits. Jeff followed the light. We had never discussed such an outlandish scenario, but Jeff just knew what I was thinking and swam to the bright crystal beam. Rescue swimmer Tunks mounted 40-foot swells and slid down their black slopes over and over, then suddenly popped up in the light, surprising the weak but conscious father and son. “Do you think you can get us out?” Jim asked. “We do this sh** all the time!” Jeff hollered. Then he told Clint, “We’ve gotta get you out of here!” He didn’t bother to mention that this was his first ocean rescue ever. At the time, Jeff still wore his mask and snorkel. He had slavishly stroked a 100-yard obstacle course of waves, and his own body felt the strain. Ten minutes can seem like hours when adrenaline finally begins to wane. Our four attempts to drop the basket close to Jeff failed, but on the fifth erratic swing, he latched onto the carrier while I jammed every ounce of pilot’s finesse into holding the Pelican steady. Seconds ticked by, and Jeff rolled Dad and boy into the basket. Thumbs up and … the wind caught the helo again, slinging the Blades up and in broad circles as we rose high into the black sky. I traveled a bit as Carl sucked in the line, and the Blades entered our cabin. Tunks waved. He was ready for his own rescue now. Carl lowered the basket, and several times Jeff almost had it. When he did grab it, he rolled into the ride of his life. Jeff Tunks dangled at the end of his tether, flung up, then forward at speeds reaching 50 miles per hour. Our helicopter slowed suddenly, and Jeff kept going. Three massive walls of water exploded as he hit each one. Carl, at the open side door, was beside himself. I jerked the bird upward as soon as I regained control, and Jeff swung back wildly within a few feet of the Pelican’s belly. Carl and Mark expertly retrieved the line, little by little, and finally yanked Jeff inside the cabin — minus snorkel and mask. Puking never sounded so wonderful. I glanced once behind me to see Tunks flash his (soon to be legendary) smile and thumbs up. Our battered bird flew straight back to Sitka. In this military season of my life, the personal God of the Bible was a mystery to me; I had no idea that my humble words echoed far into the future, pointing to another miraculous rescue in my civilian life. It should have been tea and biscuits for a retired commander with my background. When I left the U.S. Coast Guard in 1994, I had 20 years under my belt, a seasoned officer, with experience leading men and women to battle the elements on land and sea. I had two master’s degrees — one in business administration — plus the perseverance and drive to fly straight through any career storm in my way. Lauri and I were like pilot and co-pilot, two peas in a pod, secure in our exciting plans to raise our three sons in Kodiak, a stable environment, after decades of touch-and-go landings. But as in Coast Guard rescue simulations, in life, nothing prepares a person for unanticipated events. A single wind gust can easily tear your carefully choreographed mission to shreds. The same year I retired, I grew restless on the ground and immediately lifted off to take on the treacherous world of retail business. Long since the Bluebird rescue, an afterglow of sensing God’s presence warmed my heart, though my language never lost its saltiness, and the commander in me still demanded perfection from everyone around me. Still no commitments, just acknowledgment that God was on site. I researched what businesses might fly in an island environment, and I discovered a niche that seemed to be underdeveloped: shipping (I never thought about opening a flight plan with the all-knowing God). I contacted Mail Boxes Etc. and purchased a franchise, investing almost every penny Lauri and I had saved over the years to open a store in Kodiak. A zephyr (gentle breeze) ruffled my collar when the multinational retail behemoth Walmart said they wanted to built a store on Kodiak, but it seemed a long shot at the time. The winds picked up speed when the city approved the construction. Then, on a cold Christmas Eve in 1998, the fabric shop co-located in our building caught fire. Billows of black smoke drifted into our precious retail space, ruining packing wrap, cardboard, carpet — in fact, smoke tainted nearly everything inside our Mail Boxes Etc. store. It might have been a blessing to have the whole store burn to the foundation, because the insurance covered very little of the expense to repair the smoke damage and replace inventory. Lauri and I just stared at each other in disbelief. How could our whole future be almost wiped out in a puff of smoke? But then, we were used to challenges, and with elbow grease and perseverance, we scrubbed and borrowed money to reinvest. In three months we reopened — which is when the temperature dropped and wind gusts suddenly turned to a blizzard: Walmart opened its doors two weeks after our Mail Boxes Etc. reopening. Grand. Blue and beautiful. Our clients followed the smiley faced Pied Piper out of Kodiak’s thriving business district, and our customer traffic dropped by 70 percent almost overnight. I suddenly understood how Jeff Tunks felt blindly swimming over those 40-foot swells. How could anyone possibly forecast this scenario? Lauri worked to save our Mail Boxes Etc. franchise, while I found another niche on the island that seemed attractive. With help from financiers, I bought a seafood processing business, and we expanded to open a 10,000-square-foot oceanfront seafood retail shop catering to local residents. But in two years, my financiers grew restless. I wanted to see a profit as badly as anyone, but it was taking too long … and they demanded that I sell immediately. I started searching for a buyer, but no one was interested. I was working as a gas meter-reader in the hours I had free, and between this and my Coast Guard retirement, we were able to eek by on household bills — but unrelenting pressure was taking a toll on both Lauri and me. For me, these years of stress seemed every bit as intense as trying to keep that Pelican level above the Bluebird so many years before. But this time I knew that I could not save us. I was failing, and there was no one to rescue me. I had all the tools, the self-confidence, the moxie, but it wasn’t enough. My mind was simply over-torqued, and I couldn’t last much longer. And my family would go down with me. The invitation appeared like a single beam of sunlight through a black horizon, distant, unexpected and somehow a little heartening. It took a little discussion before I relented. We found a seat at the Kodiak Christian Fellowship — and for the next four evenings, I could not get enough of the teaching and preaching from Evangelist Bobby Conner. The Bible suddenly began to make sense on a level that fed my soul, not just my head. Jeff Tunks was the right man for the job in helping rescue Jim and little Clint Blades; Bobby Conner was the right man to guide Lauri and me to the Savior Jesus Christ — on the second night. When the man stood up on the podium, he was huge! His story included his rescue from drug dealing and suicide — and suddenly I was hooked. If God was in the rescuing business, I was the perfect candidate! As for “miracle working,” I wasn’t anyone’s fool. God himself would have to show up, or I would shut down my engines and walk. I studied each person Bobby Conner spoke to, figuring him the charlatan one moment, then hopeful, wondering if God really speaks through men “prophetically” the next. After Conner’s sermon on the second evening, I sat stiffly while he lumbered to our row, addressing folks, their hearts open to hear from God. But my heart was closed. Nothing leaked out to give Conner any encouragement or a scintilla of information about me. Conner asked me what kind of work I did, a friendly question, and I said I was in “fish stuff.” Rude. I was downright obnoxious. I glanced at Lauri: What was she thinking about all this? As for Conner, the big man wasn’t fazed in the least by my incivility. Strangely, at this landmark moment, my mind was soaring over my Coast Guard career. The instant he said the word “leadership,” I felt my soul leap into God’s rescue basket. The evangelist continued, “God will give you opportunities beyond your imagination …” and as he spoke, a soul-level rebirth was taking place in Commander John Whiddon. The Savior who had rescued my crew, the Blades and me from crashing into frigid seas aboard a battered Pelican became my Savior NOW. And my Lauri was in the basket, too. She had sacrificed her dreams to follow me from air station to air station; Lauri had shared in my triumphs and wept over my failures, and at times I had turned controls over to her, when I was at the end of my rope. The only way to describe our new relationships with God (in human terms) is to compare the experience with falling in love for the first time! We left the Bobby Conner services, and the instant I opened my eyes each morning, I felt reborn. The desire to curse at people or circumstances (or even the IRS!) simply evaporated like dew on a fuselage. I easily plotted God’s mission throughout my life to lead me to my moment of decision to serve him. Lauri and I shared an incredible hunger to know and follow our Commander. Finally, after 23 strategic years together, we were destined to form a powerful rescue team — led by the Savior of all saviors. The Bible (a dead textbook when I studied at Marchwood) became a dynamic living chart to guide us. Every time the door to Kodiak Christian Fellowship opened for teaching, we attended. And our circumstances with two failing businesses changed, too. In the next two years, we felt like we were fighting to stay alive. The icy reality was that John Whiddon’s reputation was no longer in my hands. Day in and day out, I seemed to be breaking promises to creditors, stretching payments to satisfy those who threatened the loudest. I had every intention of paying my debts, but no one would give me space to regroup. We were floating in this sea of red ink for about a year after the Conner conference, when I was driving a familiar stretch of road, feeling crushed by the weight of my failures. I was mentally rehashing options again, as I noticed steep cliffs along the highway. They invited a solution to my problems: My life insurance would carry Lauri safely out of debt and even finance our sons’ college tuitions as well! I took my hands off ALL the controls for the first time in my life. Instantly, I felt a massive cargo of worry offloaded from my shoulders. After this highway epiphany, nothing materially changed, except: In the depths of my heart, I knew that Jesus was in charge of my family’s future now — not me. In December of 2003 we shuttered our Mail Boxes Etc. store and sold our interest in the seafood business. In that last year of keeping afloat, God suddenly shined a spotlight on ideas that we never would have considered before we were Christians. Our hearts had opened to the mission of helping others, and Jesus plucked us out of the icy waters of self-reliance forever. I shall never be able to account for our ability to pay off multiple thousands of dollars to our creditors with our sporadic, modest income stream. We began to restructure our lives so that we could give to God’s work, and our finances just grew and reproduced like a fertile garden. At 59 years old, my sense of duty feels as sharp and unwavering as in any rescue mission I flew as a lieutenant commander of Coast Guard HH-3F helicopter 1486. I ache in my heart to see friends, loved ones and associates ignoring or unable to reach the rescue basket Jesus offers. Our base of operations has been Kodiak Assembly of God where our loving crew knows that Lauri and I are living examples of people buffeted by life and restored by God’s love and grace. There came a time in my life when every point of reference (parents, family, hard-won experience, military skills and business acumen) failed me. And as a pilot, I did the unthinkable: I took my hands off the controls — and let Jesus take over. My mission has never been more clear-cut. Each day, I train God’s spotlight on the only way to safety. I appeal to my beloved family, my friends and those I work with: Follow the Light. Ten minutes after the Bluebird rescue in 1987, I had set our Pelican gently on its perch at Air Station Sitka and shut down the weary turbines. Jim and Clint Blades were cared for, and our helo immediately grew an audience, including growling aircraft mechanics. The hurricane-force winds had wrinkled the Pelican’s orange and white skin. A few needed repairs (in a laundry list) were noted: We had over-torqued the transmission and nearly blown the engines. We had damaged the hoist assembly and overstressed her fuselage. Our Pelican was the only rescue helicopter at Sitka, and no one dared fly her until she was torn down and made operational again — three weeks later. I hadn’t even changed out of my flight suit when I drove home to Lauri. She opened the front door, and my guts felt wrecked inside me. I think back on my wrenching inner struggles as a child, a young Coast Guardsman and a seasoned commander. I remember what it feels like to be abandoned; I know what it means to lose reputation and security. I’ve worn the uniform of an elite group of pilots and felt the ultimate high of rescuing survivors within seconds of utter ruin (and received the medals to prove it) — but it saddens me that almost 50 years flew past before I gave my heart and mind to my Savior, Jesus. Yet I am thrilled that one rescue during my military career continues to churn up spiritual waves to this day in my family and across the nation. Senior Chief Jeff Tunks retired as the most decorated rescue swimmer in Coast Guard history — and is now a gung-ho follower of Jesus Christ. My able co-pilot and friend, Greg Breithaupt — who now flies passenger jets — often recounts the life-changing seconds when both of us knew God was present in our cockpit. At least four times our out-of-control bird hovered a few feet off the roiling ocean surface, in the palm of God’s hand. Greg names Jesus as his Lord, too. Carl Saylor, our flight mechanic (assisted by Avionics Technician Mark Milne), hoisted father, son and rescue swimmer through the erratic Pelican’s side door. Carl openly attests to God’s mercy, too. He unknowingly linked to Jill Blade’s powerful chain of prayer that night. We rescued the Blades, and Jesus is present to answer the “Mayday!” in souls, wherever our story is told. I will forward this post to him. Pretty sure he will have a very good read.